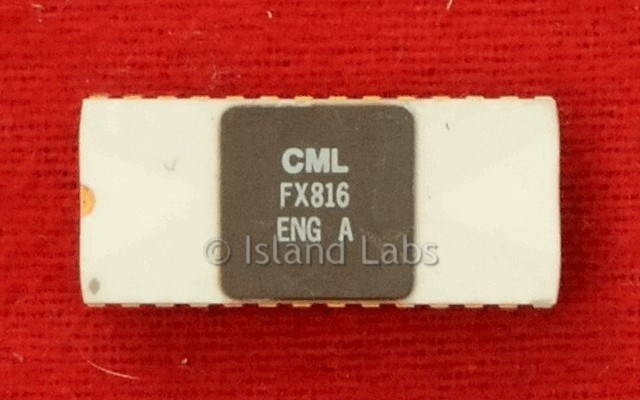 The FX816 is a µProcessor controlled full duplex audio processor on a single chip with separate TX and RX paths to provide all the filter/gain/limiting functions necessary to pre-process audio, data and signalling in the Nordic Mobile Telephone (NMT) cellular communications system. Selectable inputs available to the transmit path are a choice of two microphones, DTMF/signalling or FFSK/data, with access, in this path, to external compression circuitry. Operationally the TX path provides input gain/filtering, VOGAD, a deviation limiter and TX Modulation Drive controls. In the RX path, the SAT signal is separated from the incoming audio via a gain/filter block and made available at a separate pin for mixing externally with the TX Modulation Drive. The RX path consists of an input gain/filter block for voice and data, inputs from an external audio expansion system and an output gain control driving either a loudspeaker system or earpiece. Unique to the FX816/826/836 cellular audio processors is the ability to route audio (TX or RX) to an external Voice Store and Retrieve (VSR) device such as the FX802 or FX812 thus providing the radio system with a voice answering and announcement facility using external DRAM. The FX816 is a low-power CMOS device which reduces the amount of microcircuits and components required in a cellular audio system by providing more functions on a single chip. Is available in 28 pins plastic small outline (S.O.I.C.) surface mount and cerdip DIL packages. White ceramic case and golden pins.